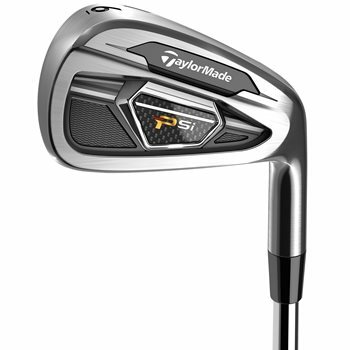 The TaylorMade PSi irons were designed to meet the demands of the better player with superior feel, an appealing look and consistent performance. The new Dynamic Feel System consists of a multi-material badge that reduces vibration across the whole face. Combined with a re-designed head shape, tungsten weighting in the long irons and forged short irons, the PSi irons deliver an excellent sound and feel throughout the whole set. The look of the irons offer a blade length, topline thickness and offset increase gradually from short to long irons to inspire confidence at address. The PSi irons also feature a new cut thru sole slot, a thin, sub 2mm face and Face Slot Technology for increased ball speeds no matter where contact is made on the face. The low center of gravity helps better players generate the optimal trajectory and distance combination they desire in every shot. The PSi irons come with the KBS C-Taper 105 shaft and have over 15 no charge custom options as well. Review by scott 8 handicap, 3 years ago. The option to change shafts to no label.. what does that mean?